Ikamiro Palace is the official residence and workplace of King Ndahura II of Busongora, and the workplace of the Busongora Parliament [Eishengyero Muhabuzi] and Busongora Kingdom's Council of Ministers. The palace grounds constitute an idyllic 1000-acre urban oasis located only minutes from downtown Kasese City. The grounds are significant for many historical reasons. In 2013 King Rwigi IV assented to a decision by the Busongora Kingdom’s Cabinet and Elders to designate Ikamiro as a royal palace and provisional administrative centre of Busongora Kingdom. Ikamiro Palace is also home to the Royal Chwezi Academy. Ikamiro aims to become not only a great royal palace but also a great library-museum and research centre, preserving items connected with the culture and history of Busongora and the Great Lakes Region of Africa [GLR]. Already the palace is home to important cultural artefacts, genealogical records, archives and cadastral registers. The king and the staff at Ikamiro provide support to the public by preserving, documenting, interpreting and sharing information. The palace is responsible for training people in Songora history, culture, administration and royal protocol. Other palace sites of Busongora Kingdom are planned at Karungi-Barole [near Hima], at Katwe and at Nyakatonzi - all of which are important Songora community settlements. Ikamiro also offers visitors a walking tour of the Rukooki River Valley featuring land forms, vegetation and important historical locations. Ikamiro Palace campus features several on-going nature recovery projects, including botanical gardens and wildlife parks. Ikamiro Palace is an Environmental Learning Centre, and has a commitment to continually improve the environmental performance of its operations, and the environmental awareness of its staff and visitors. Parts the campus are working farms, and other parts constitute a wildlife sanctuary and are home to lots of birds and other animals - some of which stray from the nearby national parks, including the Rwenzori National Park and the Queen Elizabeth National Park. In 2007 a wild lioness lived on the campus for several months and raised several cubs there. It didn't hurt anyone during its stay over, and returned to the national park when the cubs were old enough to follow her. There are several traditional cattle kraals on the grounds. 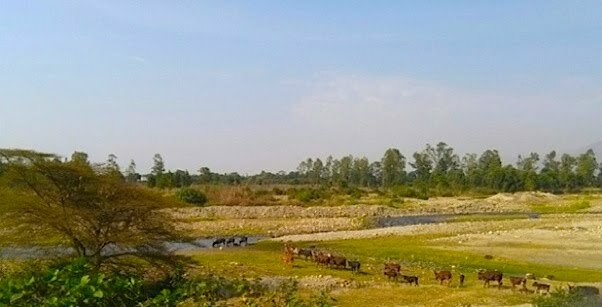 The cattle kraals have different specialty herds, including the royal eNkorogi cattle. Ikamiro sits on the north bank of the Rukooki River. The River Rukooki originates in the Rwenjura [Rwenzori] Range - also known as the Mountains of the Moon - which frames the north side of the palace campus grounds. The grounds are located in the environs of one of the ancient centres of the Kushite imperial administration [hence the name Rukooki]. The Kushite Empire fell in 350 AD and was replaced by the Axumite Empire. The ancient kraal and palace complex of Kogyere I Rusija-Miryango - she lived around 1000 AD - is located in the same area, and is contiguous with campus grounds of Ikamiro Palace. Kogyere [also 'Kogere' and 'Kogelo'] was an Empress of the Shenzi Empire [Zenj Empire]. The Shenzi Empire succeeded the Axumite Empire in Central and Southern Africa in 630 AD/CE. Empress Kogyere is the founder of Busongora Kingdom and first of the rulers of the fabled Chwezi Dynasty of Busongora. 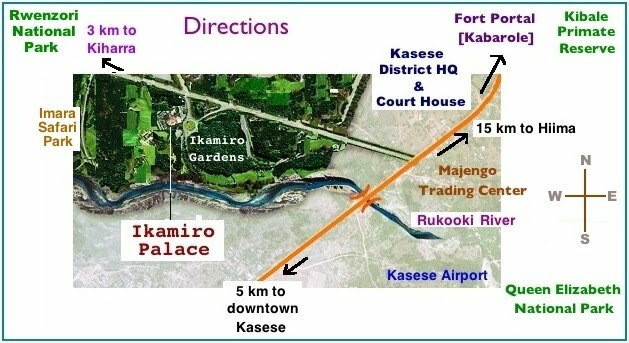 The location of Ikamiro is still important strategically. The judicial courts and administrative headquarters of Kasese District [western Uganda] - as well as a hospital, a military base, a prison and a police station - are located on the north-east boundary of Ikamiro's Rukooki campus grounds. In August 1985 Ikamiro began service as divisional headquarters for the National Resistance Army [NRA], and later as the first special school in Africa for demobilised child-soldiers. In the 1990s Ikamiro served as HQ of the 75th Battalion of the Uganda Peoples Defence Force [UPDF]. The Uganda Police borrowed Ikamiro Palace and grounds to house, train and upgrade nearly 80 Special Police Constables, during the months of May and June in 2016. The exercise was successfully concluded on June 18, 2016. Despite the fact that the palace itself is located at the base of the Great Rift Valley, and that Kasese has registered some of Africa's record temperature highs - the grounds are relatively cooler than the surrounding area - probably on account of having trees. The area is in a rain shadow, and can be extremely dry during the heat of July and December, and over the decades this feature has helped protect Ikamiro from being turned into an intensively cultivated plantation similar to the neighbouring Mubuku Irrigation Scheme. Whereas Ikamiro is re-establishing an ecologically robust niche, other parts Kasese district continue to suffer unplanned and uncontrolled urban growth, as well as deforestation and pollution. The Basongora cattle herders who traditionally lived in the area - notably a portion of the Balebeki clan, including the Bazira family, which owns the palace grounds - were unfairly evicted from the area in 1931 by the colonial administration, when the British Government planned to include it as part of the Queen Elizabeth National Park. Some of the displaced Songora relocated to Nyakatonzi and Bwera, but most crossed the border and entered the Congo. They joined other Basongora in the Parc Nationale de Virunga, as well as the Nyamulenge in Kivu and BaTuku in the Semkiki Valley. When plans to make Rukooki part of the Queen Elizabeth National Park were shelved, the area was turned into a refugee camp for members of the Masai, Gikuyu and Nandi communities that were displaced by the Mau Mau Uprising in Kenya. The Basongora began returning to Rukooki in the 1950s, but especially after civil war broke out in the Congo in the 1960s - caused by the overthrow of Patrice Lumumba. The Basongora who returned to Rukooki beginning in the 1950s were required by the state to buy back their own ancestral lands, and got to share the space with the Masai up until the late 1970s. Luckily the Masai and Basongora got along peacefully, probably on account of the fact that their cultures are similar in many ways. Eventually the Masai refugees were moved to Ibuga Refugee Camp. In recent decades most Basongora moved out of the Rukooki area due to insecurity and violence targeting Basongora land-owners. Ikamiro Palace remains one of the few places in Rukooki Sub-County still occupied by indigenous Basongora. Ikamiro Palace and the palace gardens and parks are open to visitors. Guests and tourists without reservations are welcome during daylight hours. Campers and backpackers are also welcome to stay on the palace camp grounds - some have stayed for several months at a time. The palace has good security arrangements, including a permanent police detach. There are safety rules for use of the palace campus grounds. The rules are designed for the comfort and protection of both the wildlife and the humans. Guests must enter and leave premises via Main Entrance Gates. Do NOT enter or leave premises without notifying Staff or Security. Do NOT give money to anyone who can’t give you Permits or Receipts. Do NOT walk about Restricted Areas without permission from a Manager. Do NOT cut or prune flowers, creepers, twigs and trees, without permission. Do NOT frighten, hunt or kill birds, insects, reptiles, or any other wild animals. Do NOT disturb nests, eggs, stones, leaves, or any other live or natural items. Do NOT leave waste - paper, metal, glass, rubber, plastic trash - on grounds. Do NOT bring poultry or cows, or any uncertified animals onto the grounds. GMOs, dope, weed-killers & pesticides are NOT allowed on the premises. Chemical and Industrial Fertilizers are NOT allowed on these premises. Loud noises, or menacing and disordered conduct are prohibited.